After a very long break I have finally got around to making a new blog site – or at least I’ve got around to asking my daughter to make one for me. I haven’t been too lucky with the last couple of sites about HBOS. I had to take one site down when Thames Valley Police started their investigation into HBOS Reading – because all the blogs were about HBOS Reading and contravened sub judice. So I started a new site with slightly less specific blogs but it was still mainly about the misdemeanour’s of HBOS. And one particular blog I wrote resulted in a rather menacing phone call from an ex HBOS banker and an even nastier virus being attached to the site which contaminated any reader’s computer. So it had to go. Anyway, third time lucky and I won’t waste time explaining what I’ve been doing since I took that blog down, I’ll move straight on to a subject that is becoming more and more prominent in the news (not that it ever went away) – the merger between Lloyds and HBOS and the legality (or not) of the HBOS Rights issue. I will just add however that I have been busy writing a book about HBOS and while I can’t publish it until next year when the criminal trials re HBOS Reading should be over, I can publish some non-specific extracts from the book as well as some of the research for it – which I have done below. Some key points from the Bank of England report on ELA to HBOS & RBS. Oct 2012. 21. …..The judgement as to whether or not to activate ELA in 2008 needed to address three core criteria—that the potential failure of the banks in need of support should be judged to be a threat to systemic stability; that the banks receiving support should in a broad sense be solvent; and that there should be a feasible exit strategy from the ELA— ……. 22.The second criterion of solvency is never easy to assess because difficulties in funding can quickly transmute into impairment of solvency. But for both banks in 2008 there was a concrete path to future solvency on which the Bank could base its decision to extend ELA. In the case of HBOS, the path to future solvency at the point ELA was extended appeared to be the merger with Lloyds TSB that had been announced on 18 September 2008. 98. As noted above, the run on Northern Rock marked a step-change in the level of the Bank’s engagement with individual banks and it is clear that the Bank, and indeed the other members of the Tripartite, were fully aware of the vulnerabilities of HBOS prior to its need for ELA in October 2008. By September 2007 the Bank was receiving what it felt were more appropriate data from the FSA, at any rate on banks identified as more vulnerable, including daily liquidity reports from the FSA on HBOS (as well as on Alliance & Leicester and Bradford & Bingley). 101. From late-2007, the Tripartite authorities began contingency planning to map out possible options for resolving HBOS should the key risks facing it crystallise. There was heightened monitoring of HBOS from March 2008 after the emergency sale of Bear Stearns on 16 March and after an unfounded market rumour that HBOS was receiving emergency assistance from the Bank caused a sharp fall in HBOS’s share price on 19 March. At this stage the Bank was considering in detail the consequences of HBOS, like Northern Rock the previous September, being unable to fund itself in the markets. 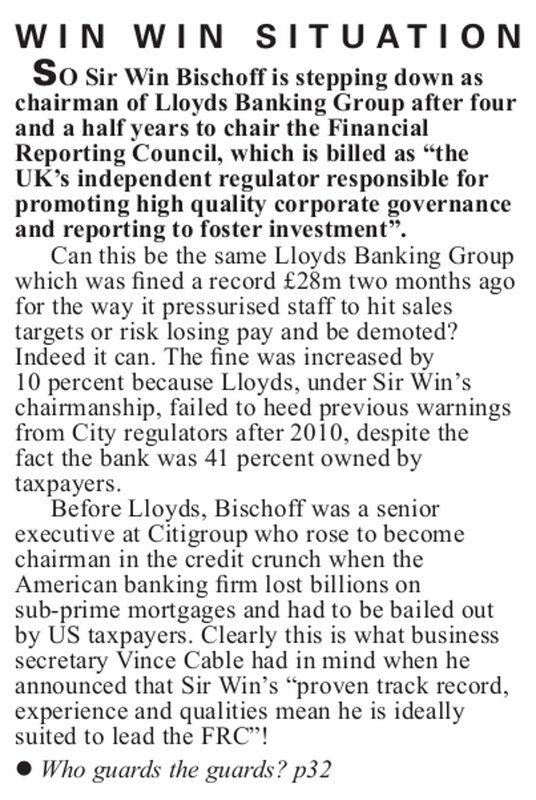 In other words, by March 2008 the BoE & the FSA absolutely knew HBOS was broke and yet they still let them proceed with a misleading Rights Issue! 102. By mid-April 2008, although still work in progress, a comprehensive contingency plan had been prepared by the FSA, in conjunction with HMT and the Bank. This contingency planning explicitly recognised the possibility of the Bank needing to undertake some form of ELA in the event of wholesale markets beginning to close to HBOS. Although by May the immediate threat to HBOS appeared to have receded somewhat, in part because it was able to utilise the SLS launched in April, the Bank continued through the summer closely to monitor HBOS’s liquidity strains on a daily basis as HBOS endeavoured to scale back assets and increase deposits in order to reduce its reliance on wholesale funding. In the event, wholesale funding became increasingly difficult as the maturity of funding available to HBOS shortened, progressively increasing the ‘snowball’ of funding that had to be rolled at shorter maturities. With the failure of Lehman Brothers on 15 September, HBOS’s position rapidly became untenable. When it finally needed to seek ELA from the Bank on 1 October, the approach did not come as a surprise and the Bank was able to respond rapidly. The Directors of HBOS, the BoE, FSA and the Treasury, were fully aware when the Rights issue was announced that; the Bank was insolvent but for the fact it was receiving substantial funding from the SLS (Special Liquidity Scheme) as of 21st April 2008 – 8 days before the Rights Issue. By 1st October HBOS was forced to go to the BoE to get Emergency Liquidity Assistance (ELA) which they got and which peaked at £25.4BN on 13th November 2008. This funding was kept secret until 24th November 2009, by which time HBOS was part of Lloyds Banking Group and investors in both HBOS and Lloyds TSB, had lost their money. This entry was posted in bailouts, Bank of England, Banking, HBOS, Lloyds Banking Group, Rights Issue and tagged Andy Hornby, bailouts, Bank of England, bankers, banks, ELA, FCA, FSA, HBOS, Ian Fraser, Lloyds Banking Group, Lord Stevenson, Paul Moore, Rights Issue, SLS on August 8, 2014 by SME Alliance.